Should people be fined for sleeping on park benches? Should they go to jail for begging? All of us are subject to multiple rules and regulations governing how we can use public spaces, such as street corners, sidewalks and parks. As the French poet Anatole France said, “In its majestic equality, the law forbids rich and poor alike to sleep under bridges, beg in the streets and steal loaves of bread.” Yet few of us are aware of many of rules governing public spaces since we are generally able to meet our daily needs and go about our daily activities without violating them. The use of legislation, policing and the criminal justice system to respond to homelessness is referred to by researchers like Bill O’Grady and Stephen Gaetz as the criminalization of homelessness, defined as “the use of laws and practices to restrict the activities and movements of people who are homeless, often with the outcome being fines and/or incarceration” (O’Grady, Gaetz & Buccieri 2011, 7). So what are some of the laws criminalizing homeless in Ontario? What activities are prohibited? At a press conference calling for the repeal of the Safe Streets Act, tickets received by homeless people were dumped on the table. Image from e-petition to sign the appeal. 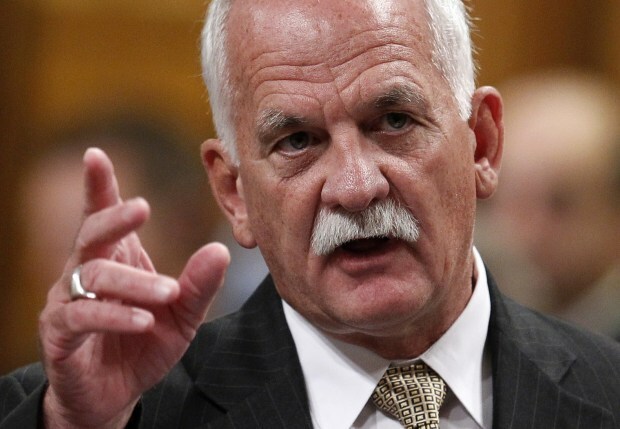 When the Safe Streets Act (SSA) was introduced in Queen’s Park, MPP Gerry Martiniuk claimed it “has absolutely nothing to do with homelessness. It has nothing to do with panhandling”. Don’t be fooled. It has everything to do with homelessness and panhandling. 2. (2) “No person shall solicit [panhandle] in an aggressive manner”. An ‘aggressive manner’ is one that is “likely to cause a reasonable person to be concerned for his or her safety or security”, meaning what constitutes aggression is subjective. Examples of aggression include threatening someone, obstructing their path, using abusive language, soliciting while under the influence of drugs or alcohol, or persisting in soliciting after someone has responded negatively. 3. (2) No person shall solicit a captive audience. Examples of a ‘captive audience’ include a person waiting near an ATM, payphone, public toilet, taxi or public transit vehicle; a person in or on a public transit vehicle or parking lot; a person getting in, out of, on, or off a vehicle; and a person in or on a stopped, standing or parked vehicle. While curbing aggressive or threatening panhandling is an understandable goal of this legislation, a review of SSA tickets between 2004 and 2010 showed on average only 20% were for aggressive solicitation, while 80% were for non-aggressive solicitation of a captive audience (O’Grady, Gaetz & Buccieri 2011, 10). In other words, this legislation is primarily used to crack down on panhandlers who are not threatening but whose presence in a downtown core (where one is always near an ATM, bus stand, pay phone, etc.) is unwanted. 4. (2) No person shall dispose of any of the following things in an outdoor public place: a used condom; a new or used hypodermic needle or syringe; broken glass. Breaking these rules can result in a fine of up to $500 for a first offence or up to $1,000 and six months imprisonment for repeat offences. The usual fine is $60, but still unlikely to be an amount that can be paid by a panhandler. Over 11 years in Toronto, the total value of tickets issued is over four million dollars, of which 0.2% has been collected (O’Grady, Gaetz & Buccieri 2011, 10). Not surprisingly, ticketing the poorest members of society is not a lucrative endeavor. The Trespass to Property Act prohibits entering and remaining on property “without the express permission of the occupier” 2.(1). People can be arrested without warrant for trespassing, and even if there is “reasonable and probable grounds” they were trespassing 9. (1) & 10.(1). By definition, people who are homeless lack a home. They lack access to private space. Seeking spaces to sleep or even just hang out with friends can result in charges of trespassing or loitering. The Liquor Licence Act regulates the “responsible use” of alcohol. As with the trespassing, its impacts are most keenly felt by those who lack private space. (c) a private place as defined in the regulations. Those violating these regulations can face fines of up to $100,000 and/or imprisonment of up to a year. In addition to these provincial laws, cities create bylaws which penalize and exclude the poorest among us. The Parks and Facilities Bylaw regulates how public parks are used. These regulations are subjectively enforced and used to remove marginalized people from public spaces. The Shopping Cart Bylaw prohibits the use of a shopping cart outside of premises of the business that owns the cart (4.2). Shopping carts found on city property can be impounded (8) and their contents disposed (13). Only those without secure private space need to keep personal belongings in shopping carts. This list of laws and regulations is not meant to be exhaustive. But it illustrates how the activities and even the presence of people living in extreme poverty is restricted and ultimately criminalized in Ontario. Rev. 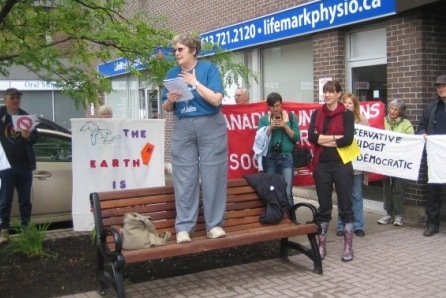 Frances Deverell is the president of the Canadian Unitarians for Social Justice (CUSJ). 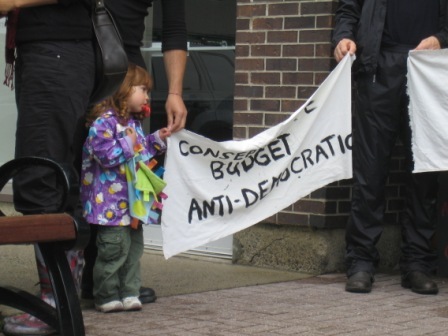 On Saturday, June 2, she joined the Leadnow protest in Ottawa outside Conservative Minister John Baird’s office and delivered a rousing speech to a crowd of over 100. A big thank you to Lead Now for organizing this rally and to Anita Grace for stepping up to be the local contact on the ground. And thank you so much for inviting me to speak on behalf of the Canadian Unitarians For Social Justice. Thanks to all the Unitarians and all the rest of you who came here today to stand in the rain and protest this terrible budget bill. Shall we take a page out of the Occupy Movement and try the human microphone? Yes? Rev. Frances Deverell addressing the June 2 rally in Ottawa. I didn’t want to come out here and stand in the rain for a protest! Did you? I came because my heart is broken. This budget bill is a terrible bill for Canada. I came to stand on guard for Canada. As a Unitarian minister I want to hold up 3 principles I hold sacred. The first is democracy. 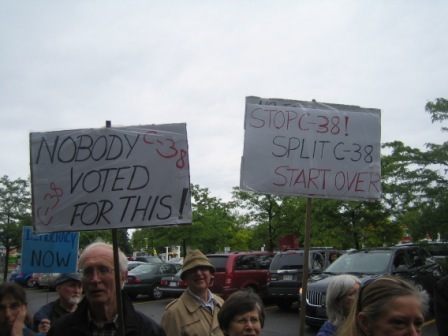 I object to the process of C-38. An omnibus bill hides the facts. An omnibus bill suppresses debate. We pay MP’s to examine the details give close scrutiny debate and LISTEN! Closure gives no time for this. In a democracy government regulates industry for the benefit of the common good. This budget fires scientists who study Canada and produce knowledge. This budget fires librarians, archivists, and statisticians who organize and store and make meaning of knowledge, and who keep our history. It doesn’t want to make decisions or set policy based on knowledge. It doesn’t value who we are. This budget fires inspectors in all areas. When government abrogates its responsibilitiy of oversight it leaves the fox in charge of the chicken coop. We have more Walkerton’s, Food poisoning, Enbridge leaky pipelines, and Gulf oil spills. The second is the interdependent web of all existence of which we are a part. I believe the earth, the air, the water are sacred. I believe all species have a right to a place to live. Gigantic scale mining produces industrialized landscapes that wipe out all life in their path. This trend must stop. It is a false economy. We must change our ways to live in harmony with the natural world that sustains us and gives us life. Mr. Harper and Mr. Baird are dismantling our environmental protection, to promote fast tar sands growth. The want to ignore their obligations to consult with First Nations who live and die eating polluted wildlife. They care nothing for the needs, and well being, of future generations. This bill changes the face of Canada without even a debate for the sake of greed and profit. This government was elected by 39% of the vote but it wields 100% of the power and gives 61% no respect. One minister can make and change rules with no consultation. Absolute power corrupts absolutely. Why are they afraid to talk? Why are they afraid to listen? Third: I hold justice, equity, and compassion sacred. Where in this budget do we care for the homeless? Where in this budget do we care for the hungry? Instead, funding for medicare and education is threatened. Our pensions are under attack. For the first time our children will have less security and well being than we have had. The social safety net that my parent’s generation set up is being dismantled piece by piece. I stand here today in the rain to stand on guard of Canada. I call on this government to slow down, slow down, slow down. Break up this bill. Give us a national debate about the kind of Canada we want. We want government oversight of industry. We want respect and consultation with First Nations. We want equity and a fair chance for all people and all life. Across Canada today, people gathered at the offices of their local Conservative MPs, looking for 13 ‘hero MPs’ who will vote against the omnibus budget bill. Repealing the Environmental Assessment Act and replacing it with a whole new Act. Restricting the length of pipeline environmental assessments. Extending the age at which Canadians will be eligible for old age pensions. Removing the Office of the Inspector General, responsible for CSIS oversight. Eliminating the International Centre for Human Rights and Democratic Development. Eliminating the National Round Table on the Environment and the Economy. Eliminating the First Nations Statistical Institute. Eliminating the National Council on Welfare. Here in Ottawa, on behalf of LeadNow, I organized a protest outside the office of Conservative MP John Baird. I was amazed and humbled by the turn-out – probably 120 came out – despite cool weather and threatening rain clouds. We raised our voices in solidarity, telling our government that we are watching and we are deeply concerned. One of the things I heard repeatedly from people at today’s rally was that this was the first time they had participated in a protest, but they felt compelled to come out. “We will not be silent,” said Rev. Frances Deverell of the Canadian Unitarians for Social Justice and the crowd shouted back, “We will not be silent.” Silence is not an option when democracy and our environment are so threatened. A movement is growing across Canada – and today, it was thrilling to be a part of it. For more information on Bill C-38, please see the attached pdf which was prepared and shared by Patricia, one of those attending today’s rally. I would also encourage you to check out Black Out Speak Out. The many changes to the Canadian Criminal Code legislated by C-10 have not satisfied this government’s hunger for more bills to get ‘tough on crime’, restrict the rights of offenders, and curtail judicial discretion. Since the beginning of this current Parliamentary session, 221 private member’s bills have been introduced in the House. While these bills cover a wide spectrum of public policy (such as setting standards for cancer screening and increasing public awareness of epilepsy), many of them are focused on crime. For example, Bill C-394 will create a new criminal offence for recruiting young people into gangs. Another will levy $5,000 fines or jail terms of up to 10 years for wearing a mask or face paint at a riot. Another will give federal prison officials more authority to dismiss inmate grievances by deeming them “vexatious” or “frivolous”. Another private member’s bill, loudly applauded by the Conservative benches, will repeal Section 13 of the Canadian Human Rights Act and prevent rights claims based on hate speech from being brought before human rights commissions. For example, Bill C-299, presented by Conservative MP David Wilks, would require mandatory five-year jail terms for kidnappers of minors. David Wilks is a former RCMP officer and mayor of the B.C. town where Kienan Hebert went missing last fall. The issue of kidnapping of minors has also been flooding the news with the recent trial of Michael Rafferty, who was found guilty of first-degree murder, abduction and sexual assault of 8-year-old Tori Stafford. In response to Bill C-299, retired Supreme Court of Canada Justice John Major urged the Commons justice committee to refrain from further tying judges’ hands. He also warned the the Criminal Code is becoming too complicated as legislation is “patched” together with ad hoc amendments. Nonetheless, private member’s bills such as C-299 are easy to draft and are almost a sure to gain public support, especially when Rafferty’s case is still so fresh in our minds. Expansion plans for a federal prison in Kingston, Ontario show provisions are being made for double-bunking – a practice condemned by many as being dangerous and inhumane. Candice Hoeppner, Parliamentary Secretary to the Minister of Public Safety, said the government does not have plans to make double-bunking permanent, but that preparation for them is “just good planning”. Double-bunking, putting two inmates in one cell, is already practiced in Canadian prisons. Corrections Canada reports that 13% of inmates are currently double-bunked – and this figure could rise as high as 30% as the tougher sentencing provisions of the omnibus crime bill come into effect. In 2010, Jeremy Phillips, 33, an inmate at the Mountain Institution in the Fraser Valley, was killed by his cellmate Michael Wayne McGray, a man serving six concurrent life sentences for murders. Howard Sapers, Canada’s correctional investigator, has condemned double-bunking for increasing violence between inmates, threatening the safety of guards and increasing the spread of infectious diseases. When questioned about the practice of double-bunking by CBC’s Evan Solomon in August, 2010, Public Safety Minister Vic Toews said that double-bunking is “not something that is inappropriate or illegal or unconstitutional or violates international standards”. Toews went on to say that “many countries use double-bunking and quite frankly I think in many cases it’s appropriate”. However, Justin Piché points out the practice of double-bunking contravenes the United Nations’ Standard Minimum Rules for the Treatment of Prisoners. Section 9. (1) of this international standard states that “Where sleeping accommodation is in individual cells or rooms, each prisoner shall occupy by night a cell or room by himself. If for special reasons, such as temporary overcrowding, it becomes necessary for the central administration to make an exception to this rule, it is not desirable to have two prisoners in a cell or room”. 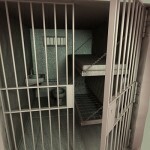 Additionally, the Canadian Criminal Justice Association argues that the practice of double-bunking threatens the safety of inmates and staff and, ultimately, the public.